TOWCESTER TAXI AIRPORT TRANSFERS 01908 263263 RELIABLE ROAD TAXI TRANSPORT: Uber is struggling in the UK. Can India's Ola do things differently? "Ola says that it is committed to raising safety standards in the UK’s private hire industry from the get go, unlike Uber," says Steve McNamara, general secretary of the Licensed Taxi Drivers’ Association. With Uber’s reputation harmed, "Ola will be hoping to establish itself as a more ethical alternative," adds Lauren Foye, an analyst at Juniper Research. Cautious about diving straight into London traffic - not least in light of all the issues Uber faced in recent years, the Indian company has chosen South Wales and Greater Manchester as pilot areas. An Ola spokesperson says the decision was based on "positive engagement" with the local authorities. 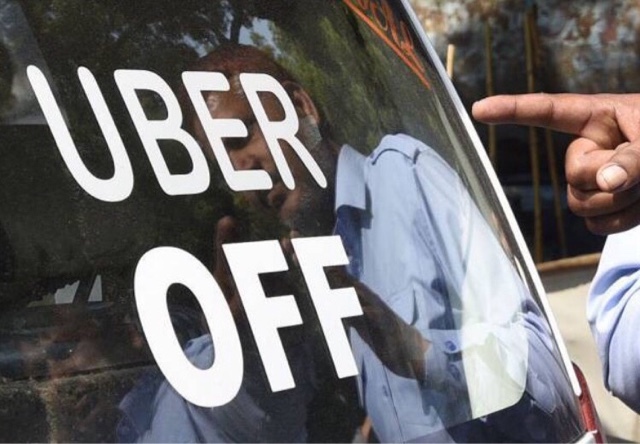 Analysts, however, put it quite bluntly: rather than enter the fray in locations where ride-sharing is being scrutinised from a legal perspective, Ola is looking to get a foothold in areas yet to be significantly disrupted by the gig economy. So who is Ola? Backed by SoftBank, the company has had its fair share or problems in its native India. There have been reports of drivers engaging in unethical and at times criminal behaviour, while Ola itself has been accused of exploiting its drivers, by first offering incentives to sign up and then cutting earnings later. It’s enough of a track record to make UK consumers wary, says Foye. "To address this, Ola will need to impose stringent checks on its drivers, and could look at features to make customers feel safer, such as panic buttons or CCTV equipment," she adds. A major challenge to succeed with customers and to hire drivers will be brand recognition. "It is not known," says Yugal Joshi from Everest Group, a research firm. "[It will need] a meaningful marketing blitz around its entry, create incentives for drivers, work with regulators to better understand the constructs, and understand the taxi habits of UK passengers," he adds. What it shouldn’t do is market taxis as an alternative to other modes of transport, as it does in India. Instead, Joshi argues, it should make it essential for British commuters. That Uber and licensed cabs have to make space for a newcomer isn’t a total surprise – quite the opposite. "The demand for that type of (sharing) mobility is certainly there, and I certainly believe that transportation as a service is going to grow," says Egil Juliussen, an analyst at IHS Markit. Uber, Ola and a few other major ride-sharing players such as Lyft and China’s Didi are just the beginning. The next step will be, inevitably, driverless cars – and that will at least remove the problem of underpaid or unethical and abusive drivers. Pilot projects using driverless vehicles are growing in number, and Waymo, GM, Uber and Lyft are set to bring them to our streets in just a few years’ time. This, in turn, will make the cost of sharing mobility plummet, driving up demand and slowly but surely killing car ownership. "The peak in terms of car ownership will come very, very soon," Juliussen predicts. For now, passengers will have to share their cab with a driver – and many UK drivers may soon find themselves working for an Indian firm. The UK, Ola’s spokesperson says, "marks a natural but significant next chapter in our international expansion," – after its expansion into Australia in January this year. The UK, the spokesperson adds, is "crying out for a responsible, new competitive player". Ola will offer British passengers something different from Uber. And it has grand plans. Greater Manchester and Wales are "only the beginning", the spokesperson adds. We received this email today from a driver. Name and badge number have been reserved by us. I'm a London Cabby - only found your website this morning - another cabby recommended it. I read the article in TAXI magazine yesterday about sueing Uber, and could not believe what I was reading. Mishcon de Reya, the legal firm that is supposed to be putting the case together, are the most bent legal firm in London !! Private Eye magazine have spent the last decade trying to uncover some of the corruption and cronyism at Mishcon. They are the Establishment cover-up legal firm of choice !! 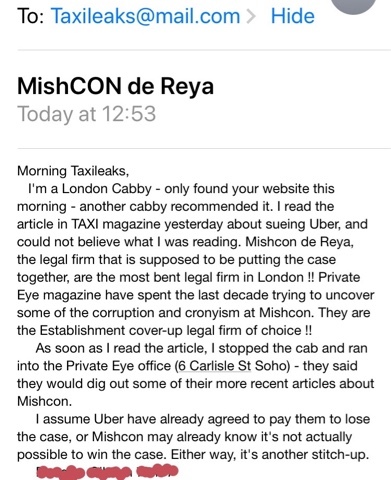 As soon as I read the article, I stopped the cab and ran into the Private Eye office (6 Carlisle St Soho) - they said they would dig out some of their more recent articles about Mishcon. I assume Uber have already agreed to pay them to lose the case, or Mishcon may already know it's not actually possible to win the case. Either way, it's another stitch-up.